Kenny Linder, a former member of the now defunct Sony-owned Bigbig Studios, recently took to NeoGAF to offer a few choice words on the state of Nintendo's Wii U. His rant was focused on Nintendo's decision to release Super Mario 3D World at the same time as the PS4's UK release, claiming that "nobody gives a s***" about Mario and predicting that the Wii U won't even last another Christmas after this coming one. 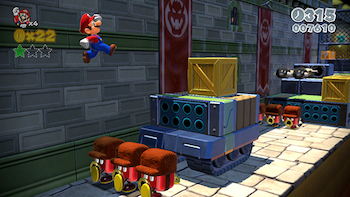 "Releasing [Super Mario 3D World] the same day as PS4 in UK/EU wasn't wise. The frustrating thing was this game was probably ready to go in October. I think retail and the market will push Nintendo in a direction whether they like it or not." Linder worries that with retail stores having four major consoles (PS3/4, 360/One), as well as the 3DS/2DS to push, Wii U may get bumped from the shelves at some point in the future. "If it goes from shelves, it will be finished," he claims, adding "I am still confident in my crazy mind that Wii U will not see another Christmas after this one." He says that future games in development for the console will simply be axed, or moved to a different platform. "Also, I haven't seen a single Mario 3D World advert on UK TV," says Linder, proposing that Mario's poor performance was due to lack-of-interest in the red-hatted plumber. "I wonder if the same gamers who buy Nintendo home systems (150k of them in UK) are the same gamers that buy PS4/Xbox? That might explain lack of sales this week. Otherwise, nobody gives a s***." Linder has since edited his original NeoGAF post, but not before Nintendo Life was able to copy it.